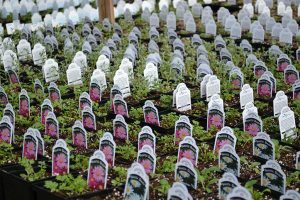 While Thunder Bay may be an area of cooler temperatures and longer winters than most, we are fortunate to have hundreds of varieties of perennials that are hardy for our northern climate. In fact, we carry over 800 varieties of perennials each year. We love our standards such as daylilies, hostas, iris’, delphiniums, and more, but we don’t stop there. Every year there are dozens of new varieties of perennials and plants available … and we grow as many as we can! Quick Fact: Perennial beds are no longer all about flowers. The latest trends include the spectacular colours and unique patterns and textures of foliage. Think of adding grasses, hostas, coral bells, sedum and more to your garden to create contrast with other foliage and flowering plants.